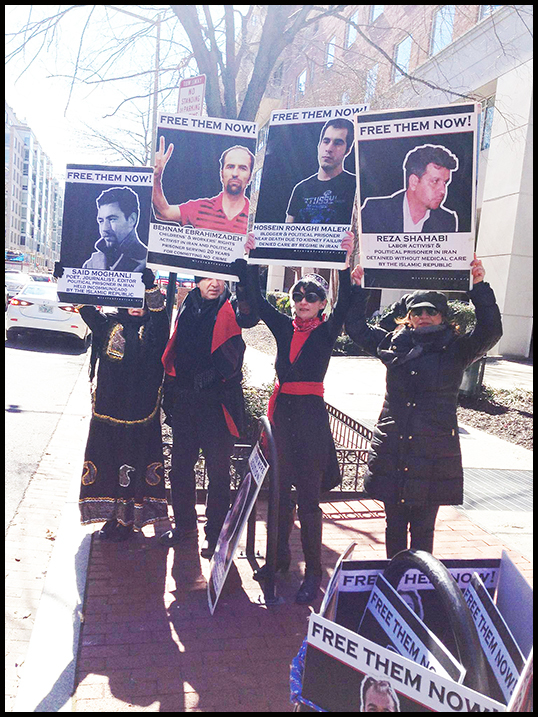 On Feb 26, 2017, activists in Washington DC gathered outside of the offices of the Islamic Republic of Iran to protest the illegitimate process that passes as “elections” in Iran. We demanded free and fair elections, freedom for all political prisoners, and an end to the Islamic regime in Iran. Good afternoon. We hope everyone is having a very happy Friday, getting ready for a relaxing weekend. We are local human and political rights activists, standing outside the offices of the Islamic Republic of Iran. We are here to demand free and fair elections in Iran! The regime in Iran would like Iranian people, and indeed the whole world, to see today’s exercise in democratic theatre as a legitimate act of a democratic government. Please be assured: it is no such thing. 1) Iranian people go to demand not Islamic “women’s rights” – they demand, as they have each and every day for the past 37 years, women’s full EQUALITY. But what the regime pulls out of the ballot box is continuation of 35 years of asphyxiating gender apartheid. How can elections be free and fair when half of the population is not even free to do something so simple as choose what to wear each day? 2) Iranian people go to demand the freedom of political prisoners, like Zeinab Jalalian, Behnam Ebrahimzadeh, Shahram Ahmadi, Omid Kokabee, Hossein Ronaghi Maleki, Mohammad Saber Malek Raisi, Sohrab Arabi, Atena Faraghdani, Zanyar and Loghman Moradi, and too many more to mention. But what the regime pulls out of the ballot box is more terror, more repression, more torture, and more imprisonment of people just like you and me, people who did nothing more than to draw a cartoon, or go to school and become educated, or went to help victims of an earthquake, who wrote their opinions in a blog, who demanded fair pay for workers… or who simply called out for FREEDOM. 3) Iranian people go to vote for social and economic justice. But the corrupt regime depends on fomenting social injustices like racism and ethnic nationalism and sexism to divide and control the population. It crushes and outlaws labor unions, kills labor leaders like Shahrokh Zamani, and keeps people impoverished so that the regime can enrich itself. The regime in Iran cannot both survive and also deliver the social and economic justice that Iranian people demand, and indeed are dying for. 4) People in Iran demand their fundamental human rights and freedoms. But the regime in Iran delivers only censorship, unfettered pollution of the air and waters of the country, execution – indeed, more than 2000 people have been executed in Iran since Ahmadinejad left office and the so-called moderate Rouhani came to power. To remain in power, this regime must trample every human right there is. For if people in Iran were truly free, they would rid themselves of this brutal and illegitimate regime in a single day. We therefore condemn the illegitimate elections for Majlis and Khobregan. We demand real democracy and free and fair elections for Iranian people. Participating in these “elections” is an act that legitimizes a corrupt regime that depends on executions, political imprisonment, and gender apartheid to maintain its grip on power. We denounce this attempt by the regime to wrap itself in a veneer of democratic legitimacy; the reality of this regime could not be further from democratic ideals of freedom and equality. Yes to democracy, no to theocracy! Zendani-e siasi azad bayad gardad! Jomhuri-e eslami nabood bayad gardad. We want free elections! No to regime selections!